« Content, pricing and convenience. How do movie rentals on iTunes fare? Simply put, improved battery life is the Holy Grail of consumer electronics. So far, advancement in battery technology for laptops, portable music players, digital cameras, and cell phones has been incremental and frustratingly slow. Stanford University researchers, however, recently announced in Nature Nanotechnology a discovery that using silicon nanowires to recharge lithium ion batteries may increase battery life by 10 times. The benefit to us, users of consumer electronics from laptops to cell phones, is greatly increased battery life, something we’ve been wanting — but manufacturers have not been able to deliver — for a long time. In theory, using silicon nanowires to recharge lithium ion batteries may mean that a two hour laptop charge could last for 20 hours. Silicon has long been recognized as good, cheap material for batteries, but it has never been applied because it expands upon absorbing lithium. Cui’s idea was to use nanowires, which can take in a lot of lithium without breaking. But before we jump up and down in celebration, let’s be clear: While extremely promising, using silicon nanowires to recharge lithium ion batteries is still in the lab with lots of work and obstacles ahead. Even so, interest in Cui’s discovery is drawing attention worldwide and he’s looking to start up a company or working with existing companies to push the technology into commercialization. 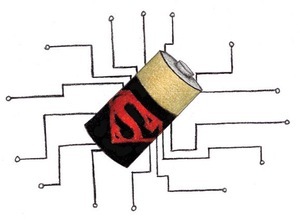 Seems everybody is still looking for the Holy Grail of battery technology.